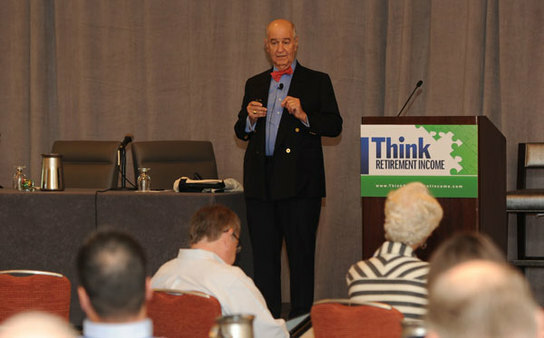 In a reversal, Harold Evensky says annuities are vital for a stable retirement. Immediate annuities will be the most important investment of the next decade, Evensky says. The perennial Rodney Dangerfield of investments is on the cusp of getting a slew of respect: Annuities are poised to become the most important investment vehicle of the next decade. That’s what the “father of financial planning,” advisor Harold Evensky, told LifeHealthPro sister site ThinkAdvisor in an interview. Chairman of Evensky & Katz/Foldes Financial, the biggest independent RIA in South Florida and managing more than $1.5 billion in assets from some 800 clients, Evensky, who formerly shunned annuities, calls the immediate annuity a powerful vehicle that’s virtually the only strategy to ensure maintaining one’s standard of living in retirement. Why Evensky, 72, converted from annuity abstainer to annuity enthusiast, he reveals in the interview. Last June the fee-only advisor, who has been expanding his practice for several years, merged with Foldes Financial Management, led by Steve Foldes, an attorney and CFP who worked with Evensky as an advisor in the 1990s, then spun off his own practice. He was originally an Evensky client. A vocal proponent of the fiduciary standard for all advisors, the Memphis, Tennessee-born, New Orleans-bred Evensky, a Cornell University grad, started out at Bache & Co. in 1967, moved to Drexel Burnham Lambert and, in 1985, went independent. His firm is based in Coral Gables, Florida, but the advisor mostly works out of an office in Lubbock, Texas, where he relocated a few years ago. On top of being actively involved in the practice, he is an adjunct professor teaching a graduate wealth management class at Texas Tech University, where wife Deena Katz — who merged her financial advisory business with Evensky’s in 1990 — is a professor of personal financial planning. ThinkAdvisor: Annuities often get a bad rap. Some people, including advisors, warn to not go near them. What are your thoughts? Harold Evensky: For many years, I was one of those people. My change of thinking came with the advent of lower cost annuities from firms like Vanguard, TIAA-CREF and others. They’re offering immediate annuities — also known as payout annuities, income annuities, longevity annuities and longevity insurance — in which the insurance company isn’t taking all the mortality gravy off the table. Why focus on immediate annuities? They’re about the only way that investors can manage their mortality risk — living longer — and maintain the income they need for the rest of their lives. The real risk that retirees don’t think about is living longer and longer. Does a deferred immediate annuity offer a big advantage? If you’re considering an immediate, it makes sense to buy a deferred annuity because in order to make the cost work, you need to have a long accumulation period and a long payout period. The tax benefits of deferral more than outweigh the cost of the product — if it’s a low-cost product. How significant will annuities become? The immediate annuity will be the single most important investment vehicle of the next 10 years. The future is in deferred immediate annuities. They can be bought when someone is 65, but they don’t start paying till the individual turns 80. People are taking the risk that they won’t live until 80; but if they do, then the payout can be relatively significant. The common wisdom has been that older people don’t spend as much as younger cohorts; therefore they don’t need as much in retirement. That’s an extremely dangerous assumption. And the best example of that is what I’ve seen on a number of [pricey] cruises that my wife Deena and I have been on: lots of people in wheelchairs and some with oxygen tanks. They may be old and getting sicker, but they’re still out there enjoying life and spending money. Some critics say that with annuities, you just get a return of capital and that if you die early, you’ve thrown money away. Those critics probably have fire insurance on their house, and they don’t complain when it doesn’t burn down. If you die early, yes, you may have made a lousy investment; but you’re dead and don’t care. What people don’t think of is the risk of not dying early. They focus too much on the probability of dying early and ignore the consequences of living longer. And people are living longer and longer. What specific role does an annuity play in a portfolio? It provides a baseline, in effect, of guaranteed income that’s independent of both market volatility and interest rate volatility. And you know that it’s not going to run out no matter what — it will last the rest of your life. So an investor with an annuity would be smart to also make some riskier investments in, say, equities. Absolutely. It’s logical mathematically to invest the balance in more volatile assets; and emotionally, having an annuity makes it more palatable because you have a baseline coming in. What’s a good age to buy an annuity? Probably 70 and older. Traditional investments, like stocks, bonds and real estate, only provide a couple of sources of income: interest, dividends or capital gains. An annuity provides a potential fourth form of income: a mortality return, which is unique to an annuity and makes it very attractive: If you live longer than the average of a particular age group making the investment, the people who die leave money on the table. Those that survive get the benefit of those funds that the [decedents] didn’t collect. What’s the main difference between a variable annuity and an immediate? A variable is simply a mutual fund with an insurance wrapper, a subaccount. It’s purely an investment that has some tax benefit because you don’t pay current taxes on it. An immediate is just a promise to receive an income stream. It’s [like] Social Security, which is an immediate annuity that has inflation adjustment, and that’s rare: You get paid the rest of your life; and when you die, they stop paying it. When would be appropriate to invest in a variable annuity? If someone is turning 70 and buys an immediate, then it may very well make sense for them to start saving for a low-cost variable. If someone is 55 or 60, it may make sense to start saving in a low-cost variable and at age 70 convert it to an immediate. Do you bring up the subject of annuities with clients? We talk about the concept, but it’s not something we’re recommending at this stage because the payout of immediate annuities is dependent on current interest rates, which are still historically low. I don’t see much risk in delaying the decision. Even if someone delays buying one for a couple of years, they’ll get the benefit of a much higher payout because they’re a couple of years older. If the Fed raises interest rates later this year, would that be a good time to buy an immediate? I don’t have a magic number. When interest rates get back to a more historical norm, then we would start looking at immediates very seriously. From an advisor perspective, why would an FA want to recommend annuities? There have been a lot of misleading presentations of annuities, but it’s a relatively easy sale with good commissions. They’re very attractive for brokers to sell [compared to mutual funds] because if someone puts $100,000 into mutual funds, there are breakpoints: The commission paid is lower with $100,000 than with $10,000. But when you put money into an annuity, there are no breakpoints. If someone puts in $500,000 the broker is getting paid the same commission as for $10,000. So it’s a great deal. Does the client have to pay the total cost of an annuity all at once? For an immediate annuity, they pay the insurance company in a lump-sum transaction. People aren’t necessarily comfortable taking a huge amount of money and doing that. Part of the concern is: Suppose I die tomorrow? The protection against that is recommending an annuity with an heirs guarantee. It will pay you every month for the rest of your life; but if you die early — even the next day — the insurance company will continue to pay your heirs for a fixed period of [about] five or 10 years. That works out to between 80 percent and 90 percent of the original investment paid to the heirs. But it’s still a tough decision for many people to take a big chunk of their portfolio and give up control of it. Do deferred immediates — aka longevity annuities and longevity insurance — make it easier for them to lay out that money? Yes. This is why deferred immediate annuities are going to be so powerful. You pay a lump sum, but it’s a relatively small dollar amount for what you’ll start getting at age 80 — a pretty substantial basic income stream. Is longevity insurance available now? Yes, not a great deal of it, though. How it’s going to work in the commission world, I really don’t know. I assume brokers must be offering it, but how they’re getting compensated on it, I’m [not sure]. I’ve read that some companies pay an income stream or some charge a fee. But it’s hard to understand how you can justify charging anything on it because once it’s done, there’s nothing else to be done. Are investment advisors selling longevity annuities? Investment advisors working strictly on a fee basis don’t sell them because we don’t get paid any commission, but it’s something that we would certainly arrange and coordinate for our clients. Is that the only issue for RIAs? The problem that fee-only advisors are going to face is an ethical issue — recommending something that will significantly reduce their income stream. Say I have a client that has $1 million invested with me and I conclude that they ought to take $200,000 and put it into an immediate annuity. Well, I don’t get paid anything for that, and I’ve just lost 20 percent of my income stream. You’re a major proponent of having all advisors held to the fiduciary standard and — relative to the Dodd-Frank Act — advocate for an undiluted standard for brokers. What’s your thinking now that President Obama has proposed Department of Labor rules for advisors of retirement accounts to adhere to the fiduciary standard? I’m flabbergasted and couldn’t be more pleased. It’s still going to be a long, uphill battle, though it stands a chance of survival given the president’s support. It looks like the most realistic opportunity to have something done, a measurable chance. With the president behind it, that clearly changes the probability; but again, it’s not a done deal by any means. Will this be the same rule as proposed in Dodd-Frank? We don’t know because the DOL hasn’t issued their proposal yet. Some brokers say that adhering to a fiduciary standard would raise the cost of retirement savings and diminish choice. What do you say? Will you and your Committee for the Fiduciary Standard — advisors from around the country — continue to travel to Washington to advocate for the standard? When given the opportunity, we’ll talk to and support the DOL’s effort and talk to the [Securities and Exchange Commission], members of Congress and regulators. We’ll continue to actively participate in trying to educate against the nonsense that [DOL rules] will limit choice and cost more. What else has the Committee done to help promote the fiduciary standard? I really think the focus needs to be on the public, having people protect themselves individually. Don’t count on Congress or regulators. Although hopes springs eternal, I wouldn’t count on it. What are the oath’s principles? “1) I will always place your best interests first. 2) I will act with prudence; that is, with the skill, care, diligence and good judgment of a professional. 3) I will provide full and fair disclosure of all important facts. 4) I will avoid conflicts of interests. 5) I will fully disclose and fairly manage, in your favor, any unavoidable conflicts of interests.” There is no earthly reason why any [FA] would be unwilling to sign that. If they are, something’s fishy? Exactly. If the firm won’t let the advisor sign it, that’s going to raise awareness on the part of investors and eventually, I believe, force the firms to change their attitude. Turning now to technology and financial advice, what do you think of robo-advisors? As an educational tool, they can be very helpful. But I’m quite skeptical about the quality of advice that’s being delivered. I’m working with a couple of doctoral students at Texas Tech on research into retirement planning software currently available to the public. My conclusions, at this stage, about its efficacy aren’t very positive. Some of it is very dangerous. For example, almost none asks whether you’re a smoker or a nonsmoker. That makes a huge difference in terms of likely mortality and how long you need to plan for. Yet many consumers think they can make as good or better investment decisions than advisors with all their training, licensing and ongoing education. Behavioral finance refers to that as a heuristic technique, or a mental shortcut: People are wildly overconfident. But [investing] is really not that easy and simple. It’s a dangerous way to plan the quality of the rest of your life. People have got a right to do it, but they’re the ones that will be suffering the consequences. You’ve been significantly expanding your business. What was the strategy for merging with Foldes Financial Management? To have more resources. I felt and still feel that we need to grow substantially. Not that I want to be a big business; but in order to have the resources we need to stay competitive and deliver what I want, I concluded quite a few years ago that we need to be a lot bigger. We continue to talk with a number of other firms about possibly merging or buying them. We don’t have anything on the horizon, but we’re absolutely continuing to look. What prompted you to focus on financial planning early in your career, when it clearly wasn’t a trend? At Bache, they sat me down at the telephone. The first lady I got sounded like my grandmother, and she hung up on me. I thought, “This is going to be a short little career.” So I went to the College of Financial Planning and then started to build my business around the financial planning process. From Bache, I moved to Drexel — before it had all its big problems. Why did you go independent? I had no problems with the firms. They never pushed me to do anything I didn’t want to do, but they didn’t understand what I wanted to do. They just didn’t understand the whole planning process.